Multiplication games can make learning math fun. Or, at least a little less painful. I don't think there's much I could do to convince our son that learning multiplication is fun, but there are a few games that we've played that he enjoys. His favorite is just a head-to-head race answering flash cards. Whoever answers the problem first wins the round. It's simple, but it keeps him entertained and he's learning at the same time. 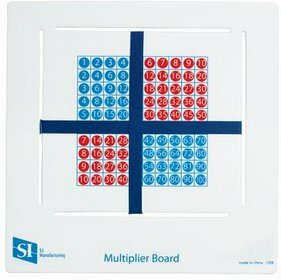 There are a bunch of different math games that you can use to teach multiplication to your child. Here you'll find a few different ones like Bingo and War that are probably familiar along with some computer games from AcademicSuperstore. You might also be interested in some of the board game books. We own 25 Super Cool Math Board Games and it's a good all-around math book. 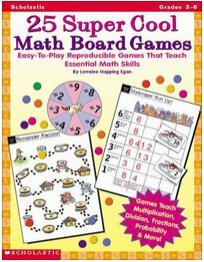 It has games that cover other mathematical topics in addition to multiplying like division, fractions, decimals and even probability and statistics. The book has pull-out game boards you can use to play the various games. When our son first started learning how to add, we tried a few of the games from the book and he enjoyed one in particular--Number Island. He liked it so much that I had to create new board pieces for him to play on. In addition to the games, I've included some DVD's and CD's that kids might find fun as well. If you have any of these, I'd love to hear what you thought about them. Leave a message below or use the contact form to let others know what you think.